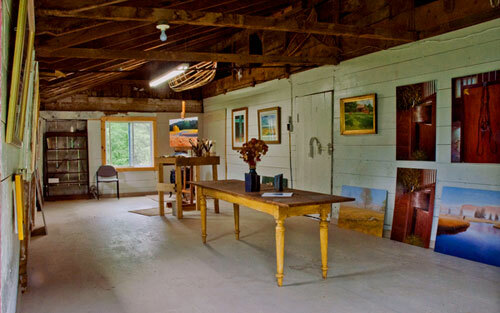 Every artist faces the day when his or her studio must become a showcase for a visiting client, dealer, or curator. It’s the moment when all the countless hours of work in solitude can at last be translated into attention and financial reward. But because it’s so important, the studio visit can also become a focus of more than a little anxiety. What’s the best way to present yourself and your enterprise to a prospective client? Clearly this is one of those potentially awkward occasions where socializing and business are combined. You want to make friends and interest the client in your work, but the subject of money is also bound to come up. I asked four professional artists to share their expertise in handling these situations. Patricia Watwood, Gregory Mortenson, Marlene Wiedenbaum, and Marvin Mattelson are all successful representational painters. Mattleson is primarily a portrait painter and so regularly entertains potential clients. The other artists are represented by galleries but find that they must also invite clients to the studio as part of the sales process. What’s your principal concern in preparing for a studio visit by a potential client? Marvin Mattelson (MM): My intention when potential clients visit my studio is to have them become so excited at the prospect of my painting their portrait that they offer me the commission on the spot. Gregory Mortenson (GM): Keeping the studio tidy and presentable. It’s always clean because I don’t want a dusty studio or dust in my paintings. The problem is that I tend to have multiple projects going at the same time; I might have a still life set up in the corner as well as several model stands in various places. Mine is a decent-size studio for New York City, but when I have all that going at the same time, it can feel small. Patricia Watwood (PW): The first thing I do is to clean up the studio and make it look (mostly) orderly. I declutter the space by putting things away and then clean the floor and surfaces, making sure to leave some clean and open space for whatever belongings visitors may have in hand. I always leave some artwork, like sketches or drawings, around for them to see because I think one of the treats of visiting an artist’s studio is to see works-in-progress and learn about how the artist proceeds; however, I like to tuck away any work that’s still in “hot-mess” stages and only keepout the things that are finished or unfinished in a “lovely” way. Lastly, I’ll put out for viewing several finished works (that might be in a rack for safekeeping). Marlene Wiedenbaum (MW): My main concern is that I know ahead of time what clients are looking for and that I’ve chosen works that appeal to them. What kind of overall impression would you like to make on your visitor? MM: I want my clients to feel they’re dealing with a highly creative and professional artist whose intention is to create a classical portrait that will exceed their expectations. GM: I want the client to leave with a good sense of my painting process and the craft that goes into it. My studio walls are covered with drawings, preliminary paintings, and color studies, all of which go toward creating a final painting. PW: First, I want the visitor to leave with the impression of professionalism and organization. The studio itself always tells a story about who the artist is. Mine is relatively “homey,” with tables and chairs for sitting and talking, and many objects that at one time or another have been used for still lifes or props. Photos and reproductions of artwork also tell about my interests and inspirations. I want visitors to feel comfortable, so I try to make sure there are chairs available and not too many fragile things they might accidently knock over. Then, I want to have out whatever artwork or other materials the visitors are coming to see. I’ll also have a catalogue from a recent exhibition handy and promotional postcards to give them. I want them to leave feeling as though they’ve had a special experience–and to take an image of my artwork home. MW: It’s important to me that a client knows that I’m a professional, that I respect myself and what I do. The relationship that develops needs to be one of mutual respect in order for it to work for both of us. Is there anything you would try to conceal from a visitor? MM: My studio is on the smallish end (12×20 feet), so I want to make sure that it’s neat, clean, and presentable because clutter and piles create a claustrophobic feeling. I also place on my easel a portrait that’s close to being finished (as opposed to a painting that’s at an awkward stage) because it’s difficult for most people to envision how an unfinished painting will ultimately look. I want my clients to harbor no doubts that I’m up to the task. GM: Maybe I’d put out of sight some of the dorky audio books and podcasts I listen to as I work. PW: I definitely hide any artwork that I don’t think is my best. Sometimes I have a new project underway that still feels too fresh and even vulnerable to be shared. MW: Because my studio is attached to my house, I try to keep my office and living areas free of any personal items. Do you feel it’s important not to show too many paintings to a potential client? MM: Quality is more important than quantity, to me. I believe it’s a good idea to show paintings that are as similar as possible to what the client is interested in, particularly with regard to subject and size. On occasion for that very purpose, I’ve even borrowed a painting I’d previously sold. GM: Most of the paintings that are in my studio are figure studies and process paintings that will help the client understand the amount of work that goes into a final painting. PW: Looking at a large number of artworks can be overwhelming and even confusing. I’d say that three to eight of your very best paintings is about right–on the lower side if they’re large. Narrow the selection to focus on your strongest area and primary subject. One caveat: I recommend that you have one or two small paintings “just sitting around.” There can be a little magic involved in visitors noticing a painting they love, and you can often sell a small work through a client’s impulsiveness this way. MW: It can be overwhelming if there’s too much to see at once. If collectors know what they’re looking for, a smaller, careful selection is helpful to me. However, I might put something into the selection that wasn’t requested, just to open a door that they may or may not walk through. For clients who just want to “see my work,” I select two or three examples of different series or subject matter with the offer that we can look further if they’re leaning in a particular direction. If the subject of money comes up, how do you handle it? MM: I’m very transparent with regard to my fees. My price list is posted both in my portfolio and on my website, so most of my clients are familiar with my pricing structure before we ever meet. I think it’s very important that, when we get around to discussing the commission, there are no big surprises. GM: I just tell them exactly what the painting is worth. I don’t want to tiptoe around the matter in an apologetic way. I want the collector to know how much it’s worth and how much work goes into creating a work of art. PW: Ahead of the visit, think about what you might sell something for. If you’re feeling nervous, I’d recommend you write it down so that in the moment you don’t suddenly say, “Oh, you can have it” or “It’s $40.” I know that sometimes when I’m in front of clients, I can suddenly feel the artwork has no value at all (just a little garden-variety artist neurosis)! You could even prepare a price list. The clients will feel more comfortable if you can give them the information directly. With a particular price stated, you might then open up some room to negotiate by saying, “I can offer some discount when I’m selling out of the studio.” But do not listen to that demon telling you your artwork isn’t valuable. Silence the demon and stand by your price. MW: This is an uncomfortable area for me, so I try to be as prepared as possible. I might print a price list beforehand. If clients have seen a particular painting that’s currently at a gallery, I send them to the gallery. It might mean I’ve lost a sale because they wanted a bargain, but it’s better than possibly losing a gallery. If they saw my work on the Internet because they liked what they saw at a gallery, I honor whatever arrangement I have with that gallery for an outside sale. Commissions and direct client sales are sometimes discounted, bartered for, or handled on a payment schedule. Create a professional appearance by presenting a clean, neat, and welcoming space. The presence of sketches and props can help create an interesting and unique environment, but don’t let things gettoo distracting. Have catalogues, reviews, articles on your work, and printed announcements of exhibitions at hand. Offer light refreshments as you would to any guest. Make sure there’s room for your visitors to move around and sit comfortably. Don’t show too many artworks. Focus on the client’s interests if you know them. Don’t leave works around that can confuse the client; paintings in difficult stages or completely different genres can distract. Be clear and forthright about prices. Make sure you know what you’re going to ask ahead of time. A printed price list can be helpful. If you have gallery representation, make sure that you’re clear about the agreed-upon financial arrangements when you sell out of the studio. Okay, not dead. But I might have had a crusty bread roll thrown at me in anger–or even a tumbler of Sambuca ‘accidentally’ spilled down my shirt. This was mine and Intent Media‘s first ever Music Week Awards. Our aim was to make the event a bit less stuffy, a mite more funny and a whole bunch snappier. But if we were hoping to please the whole room, to gift each and every wine-guzzling table with silverware and glee, an extraordinary year for the market was never going to let us. This was an awards ceremony that reflected Adele‘s magic like none other. PIAS, Purple PR and, obviously, XL and Jonathan Dickins were all befittingly saluted for their role in the industry story of the decade. Richard Russell deserved his Strat for a special recognition to the market regardless–but it’s no fluke Ms. Adkins was the first to congratulate him on screen. Yet that wasn’t the end of the indie triumphs; PIAS, Proper, Bella Union, Kobalt, Sound It Out–the non-PLC prizes just kept on coming throughout the evening. A freak landslide? Nah. The manifestation of a shifting, thrilling modern market in which anyone–large or small–can grab the ascendancy? You betcha. These were, after all, winners that you, the trade, decided. We promised the hundreds of Music Week readers who voted that their ballot would remain secret, and that guarantee remains. But I can say that our indie victors received ticks in boxes from senior executives across major labels, heavyweight publishers, dominant media houses, live giants and many more besides. It was heartening to observe, proving that behind the heat of competition; behind the jovial backbiting and the rabid sales envy, people in this business know a hard-fought success when they see one–and they know when it deserves to be recognised. It wasn’t all indie mania, of course. It was hardly a miserable night for the publishing arms of EMI and Universal, while Warner Music picked up two prizes. And, for the record, there were very few landslides–notably, the Artist Marketing Campaign, Promotions Team, Catalogue Marketing Campaign, PR Campaign and Live Music Venue categories were very close-run contests. By now, we’ve all heard the apocryphal tale of the major label boss who says he doesn’t mind the indies having Adele this year so long as the next market phenomenon is all his team’s doing. Until 2013, then. It should be a cracker. But before all that–does anyone know how to get a tricky Sambuca stain out?